The European Regions’ Cup has turned out to be a jinx for Ballyclare Comrades, with three of their four representatives who took part in the Dublin tournament having left Dixon Park. With Andrew Doyle and Kyle Buckley having already opted to go to Carrick Rangers and Ards respectively, it came as a shock to supporters when long-serving goalkeeper Paddy Flood signed for east Antrim rivals, Larne. “Paddy wanted first-team football and I couldn’t guarantee that,” said Reds’ manager David Dorrian. “I know he has been at the club for eight or nine years, and that he has figured in the Regions’ Cup several times, but we now have competition for the number one jersey. “Jonah Nicholl has been performing brilliantly for the reserves and showed up well when he deputised for Paddy on a couple of occasions and we now have recruited Sean Ward, a 27-year-old from Ahoghill Thistle, so there is competition for places. 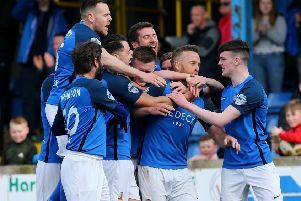 Dorrian reckons the Comrades have a tough assignment in the Steel and Sons Cup away to Ards Rangers in the first round on August 15. Rangers are reigning Amateur League Premier League champions and Border Regiment Cup holders.